When a severe earthquake destroyed homes and blocked roads, Red Cross was there to help. We’re continuing to support affected communities as they begin their recovery journey. Red Cross Disaster Welfare and Support Team member Lyn delivers supplies after the 14 November quake. Even before the earth stopped shaking, it was clear this was a big one. The 7.8 magnitude earthquake that hit in the early hours of 14 November was one of the strongest earthquakes ever felt in New Zealand, sending shockwaves right across the country. Red Cross’ Disaster Welfare and Support Teams (DWST) were quickly deployed to the worst-hit areas in Marlborough and Kaikoura. Here, the quake and its aftershocks blocked roads, destroyed buildings and ripped apart the land. One of the teams’ first tasks was setting up Civil Defence Centres for people unable to return to damaged homes. The centres not only offered people a safe place to sleep, they also provided access to food and water, information and emotional support, Red Cross Disaster Management Officer Stephen Manson said. Red Cross volunteers also helped Civil Defence and the New Zealand Army evacuate tourists stranded in Kaikoura after the quake. About 1,000 tourists were flown to Christchurch by helicopter, where they were met by Red Cross volunteers. Red Cross Kaikoura branch president Lorraine Diver and other local members spent long hours putting together food parcels, bottled water and essential supplies to deliver to people throughout the district. With roads damaged and supplies running short in the town, the parcels were a helping hand for families like Shannen, Justin and their toddler, Zaiden, after the quake. 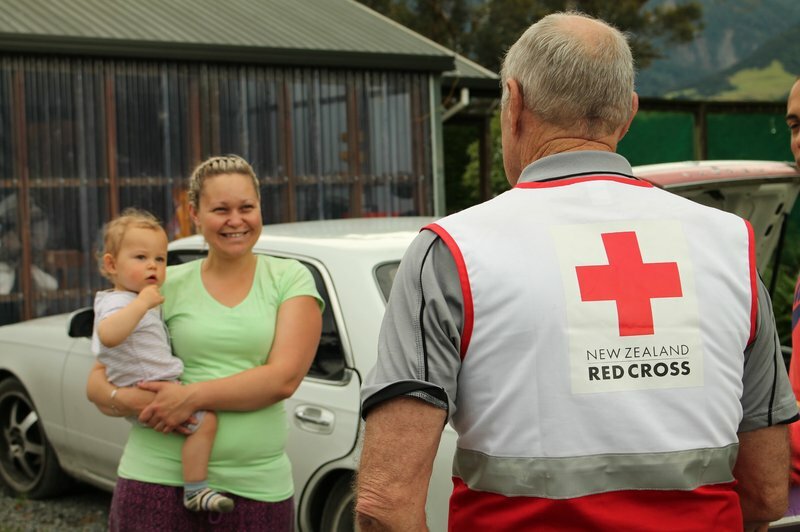 Red Cross dropped into the family’s rural home near Kaikoura to deliver a care parcel and check the three were OK. Shannen told team members she had been afraid to go into the house – even though it was declared safe – and they had spent several nights sleeping in the car. Kaikoura residents Shannen and Zaiden chat with Red Cross during a visit. Susan Cullinan/Australian Red Cross. The physical damage caused by the earthquake is easy to see. Less visible, but just as powerful, are the psychological impacts of the quake. Some people are still too afraid to sleep in their homes. Others no longer have a home. Many have lived through the Christchurch earthquakes, and many more are worried about their future, with tourists shut out of the town. Since the quake, Red Cross have been door-to-door on outreach visits throughout Marlborough and Kaikoura. DWST members, trained in psychological first aid, call in to see how people are doing and provide information about extra support available. Blenheim team member Tony Fenemor, working in Marlborough only a few days after the quake, said he saw a lot of traumatised people. “People were saying the night of the quake they were wondering when it was going to end. With sewerage and plumbing systems seriously damaged in the quake, Red Cross also deployed a water, sanitation and hygiene engineer to Kaikoura to support public health efforts. As communities now attempt to find a new normal, Red Cross is looking at long-term recovery programmes in the region. Red Cross will adapt lessons learnt after the Christchurch earthquake to support Kaikoura and Marlborough going forward, Secretary General Tony Paine says. “Recovery is a marathon, not a sprint. We know the earthquake’s impact on people’s wellbeing and the region’s economy will continue to be felt for a long time. Red Cross has now launched a Damaged Home Grant of NZ$1,000, available to people whose homes were given a yellow or red sticker or who were required to evacuate their homes for more than seven days. Find out more. Donate to Red Cross' November 2016 Earthquake Appeal. 100 per cent of donations goes towards the response and recovery efforts in the affected communities.